Kenton II 5-pc. Dining Set The best part about this Kenton II 5-piece dining set may be its ability to mix and match styles so well! Its dark walnut and buttermilk finishes serve up a casual two-toned look, plus its smaller scaling makes it a smart choice for an eat-in kitchen or breakfast nook. But this dining set also features more formal design elements, like a gorgeous pedestal table base and keyhole chair backs. And if you’re space conscious, you’ll appreciate the table’s self-storing butterfly leaf—it provides extra table space when you need it and can easily be stowed out of sight when you don’t! The best part about this Kenton II 5-piece dining set may be its ability to mix and match styles so well! Its dark walnut and buttermilk finishes serve up a casual two-toned look, plus its smaller scaling makes it a smart choice for an eat-in kitchen or breakfast nook. But this dining set also features more formal design elements, like a gorgeous pedestal table base and keyhole chair backs. And if you’re space conscious, you’ll appreciate the table’s self-storing butterfly leaf—it provides extra table space when you need it and can easily be stowed out of sight when you don’t! We have the set in our eat in kitchen and it looks beautiful. I am extremely disappointed in the durability of the table top. The littlest things scratch it through the finish. I haven't even owned it that long and it looks bad. It will even pick up pen indentations through several pieces of paper. Don't even bother buying the insurance on it, it doens't cover anything, complete waste of money. Otherwise it looks great and the delivery men were awesome even though they had to send me 3 tables before I received one that wasn't damaged. We originally purchased 57inch table set but decided to get the larger custom order set. I love the table but was nervous about using the leaf everyday...table is more sturdy without leaf. I will also have glass made for top of table since the wood top is sensitive to scratches and heat. Bang. Ouch. My knee hurts. This set has the colors and shape we wanted. It looks right in the dining area adjacent to our kitchen. The only bad point is the lack of enough room for my knees under the table. The extension-leaf mechanism is built so low underneath that my knees always bang into it when I sit down or move in my chair. Not good. Definitely not good and not comfortable for me. I am 6'2" tall. I am trying to come up with a way to attach something to the bottom of the table legs to raise it up an inch or two. I don't want counter height, just some more knee room. It's a good set for a kitchen, or casual dining room, it can be adjusted to be made bigger, or have the leaf taken out and made smaller, you can also adjust the height. Only problem is the top scratches easily and it can be noticeable. The good thing is that it's casual and doesn't really effect the over 'look' of the set. I have owned this set for two years. It looks lovely from afar, but the quality of the tabletop is terrible. If you drop water on it, a mark shows permanently. You cannot put anything hot on the table or it will also leave a mark. Basically, if anything gets on the table it leaves a permanent mark. I kept a tablecloth and a protective heat mat for one of the two years, but with small children, long tablecloths are not ideal. I wish the quality was better; we will have to replace shortly, as it looks like we've had it for decades. Purchased a new Kenton ll s piece dining set and it is the best furniture purchase we made in the past several years. The look is modern, but still has a classic look. The construct of the chairs and table are very substantial and the finish is durable. The flexibility and convenience of the foldout leaf grows the table surface area with very little effort. The price of the set was a real value, and it was a lower cost than several other furniture dealers. The delivery crew was neat and professional in setting up the set. The site was perfectly clean when they finished. I bought the set to replace my worn kitchen set. I received many compliment on it. It is very well made, the table and chairs are both very sturdy as well as good looking. The delivery people were very polite and did a good job assembling the set. I am certainly going to be buying more furniture at Raymour and Flanigan. We took delivery on this Kenton II dining set yesterday and are very pleased with the quality of this product. It is sturdy and looks great in our kitchen. The whole purchasing experience from sales to delivery went very smooth. One of the chairs had a manufacturing defect, but it was replaced on the same day. After viewing many dining sets, this is the one that met my taste and budget. Cant wait ti have xmas dinner with the family. Quality and décor encompass this set. Delivery people were great, efficient and mannerly. We love this table! It fits perfectly in our kitchen and is very comfortable to sit at. Delivery was so easy and they set it in the right place! I love this dining set; it is absolutely what I was looking for and can be used in many different decors. It is also expandable and can be adjusted to counter-height if desired. 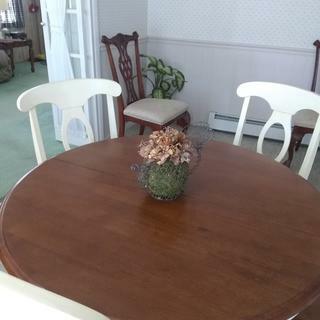 This dining set is the perfect compliment to our front sun room/dining area. The buttermilk finish looks beautiful in the sunlight and is only improved by the contrasting darker color of the tabletop and chair seats! Just love this set?? Great quality, love the antique finish. I was worried about purchasing due to having pets , but no scratches. It looks great in my small space. I bought this for my daughters new house and it is perfect. It's super heavy and look great! There is no doubt that this is a beautiful set. There are a few little "things" however. The seats are a little hard to sit on for long periods of time... but that is easily remedied with some nice cushions. The tabletop seems to be susceptible to marking, so a tablecloth or glass piece would be in order. That being said, the set is really, really nice. This dining room set fits perfectly in the space we have in our kitchen. The two-toned color scheme keeps the room from looking smaller. We love that we can expand the table out to fit two more people if needed. The table and chairs are both sturdy and well-built, so we anticipate them lasting us a long time. We felt that the fact that it comes with the extender to change the table to counter height should we wish to do so in the future would have been a good selling point. The first time we got stuff from Raymour and Flanigan and it won't be our last!! Great product, They delivered it when they said and clean set up. Great company. Our set arrived in perfect condition in the time frame that we were given. The delivery men were extremely friendly and had it set up in minutes. I would highly recommend this dining set. 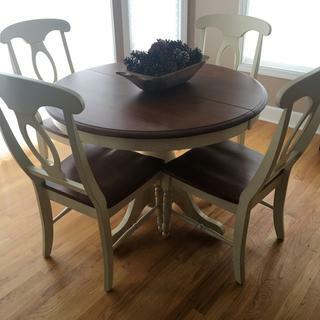 Rec'd this dining room set on tuesday 8/4/2015 delivery was right on time It looks great in our dining room love the color and the style made of real wood and is very sturdy the delivery people were very good set the table up with no problems I would recommend this set to any one not to big and not to small seats 6 with no problem . Love this set. Fits well in space; I have a small dining room. Service and delivery was very efficient and professional. Couldn't be more pleased. Furniture is good value for the price. Love self storing leaf. 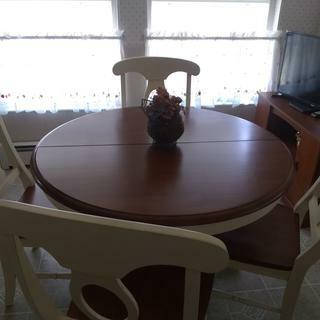 Very well made table and chairs, color is actually more saturated than the picture shows. Beautiful brown and butter milk ! Delivery - super! Quick, clean, pleasant crew. This table was made for gathering. Love this set. Not only does it look great in our space but having the hidden leaf allows the opportunity to quickly make the table larger when needed with out having to find a place to store the leaf. The only negative is the large areas on the chairs and base that were missed with paint. Overall, very happy with this purchase. I have a small dining area. Thus far I haven't encountered any problems with the top. When they first assembled it the had it at the higher position and with the leaf in place. When I explained that wasn't what I wanted, they took it apart and made it the correct height. The chairs are very comfortable and appear sturdy. Love this set just the right size and the colors are perfect in our home. I am please with this set. I have only had it a week or so but it looks lovely in my dining room. This set looks beautiful and we love the built-in leaf. However, the tabletop is too sensitive to scratches and heat. It's just two adults using it! Very disappointed. I love the look of this set in our kitchen, but you cannot put anything on this table slightly warm or warm. Leaves marks all over the table. Why would they make a table where you cannot even put a cup of coffee down, nothing even lightly warm can be laid on this table. I am super disappointed that someone would manufacture a table to be put in a kitchen and you have to be conscious of everything you sit on the table, cold or hot. Even cold things make a white mark. I would not buy, had our table over a year now and wish someone would have put this review up so I would have saw this. After 30 years, I decided to purchase a new table set for my kitchen. This set goes very well with my kitchen décor. I would recommend it to friends and family. This table is absolutely gorgeous, it was originally got for the kitchen but it is so nice we used it for the dining room. I colors are absolutely beautiful. I HAVE THIS KITCHEN SET IBOUGHT IT TWO YEARS AGO I LOVE IT .IT LOOK REALLY NICE IN MY KITCHEN. how do you change height? Can this set seat 6 comfortably?. BEST ANSWER: This table can accommodate six with the leaf in place, however it will be a somewhat tight fit. BEST ANSWER: There is a piece of the base that is removable to adjust the height. Is the buttermilk color slightly distressed? And is there a buffet or hutch to match? BEST ANSWER: The buttermilk color does have a very slight distressed quality to it. BEST ANSWER: The diameter of the Kenton II without the leaf is 42" and including the leaf the dimensions are 57" L x 42" W. Additional details can be viewed by clicking on the "Dimensions and Weights" title to expand the section. is their a weight limit for the chairs? Are the chairs all wood? BEST ANSWER: The weight limit is 300 lbs. The chairs are made of all wood. Who is the manufacturer and is the set made in the US? BEST ANSWER: This collection is made by Bellanest and is not made in the US. does it come wtih a top rather than walnut? BEST ANSWER: We do not carry this dining table with a white top. If the manufacturer offers it in white we may be able to special order it for you. Please call your local Raymour & Flanigan showroom for further special order details. What size rug fits under this 5 piece dining set? BEST ANSWER: A 5'5" x 7'9" would fit nicely, or larger depending on the size of your room. What size tablecloth would be a perfect size for this tablecloth? I already bought two and they are too small. BEST ANSWER: 52x70 oblong fits with the extension. what cleaning solution can I use on the top as not to dull the surface? BEST ANSWER: We do not recommend any specific chemicals or cleaning products. It is best to wipe the table with a damp cloth and then dry thoroughly. Who is the manufacturer of the set? Is it made in the US? What are the dimensions of the seat on the chairs? What size chair cushions would fit? BEST ANSWER: Hello Victoria! The Kenton Dining CHair seat dimensions are 19.75" W x 23" D.
Is there a matching hutch or server for this set? BEST ANSWER: The Kenton Dining Set does not include a hutch or server. With In-Store Pickup Service, assembly would be required. If the The $1200 includes the delivery fee. Can I still apply for the 12 month interest free loan? BEST ANSWER: Yes. As long as the total order is at least $1200. Can I exchange the high chair for the lower chair. Furniture was delivered yesterday and chairs are to high? This is exactly what I am interested in, except I want a round, not oval table. Is that available? BEST ANSWER: The Kenton II table in this collection is actually 42" in diameter round without the leaf. Is the top made of solid wood ? BEST ANSWER: Yes, the top is made from kiln-dried hardwood which is solid wood. How do I adjust the height on the table? BEST ANSWER: The table comes witha connector piece that rises and lowers the table. Just purchased this set & picked up at store. Put the chairs together fine w/enclosed instructions, but the assembly instructions for the pedestal table are missing from the box. Can anyone send me a copy of them, please, at below email? Or a hard copy to my mailing address, which I will supply to store personnel. BEST ANSWER: We would be happy to assist you with this. Please contact Customer Care at 866-383-4484 option 2 or the store where you made your purchase. can I get this in a different color? BEST ANSWER: We stock the dining set as pictured for immediate delivery. Other choices are available to special order and can be viewed exclusively through your local Raymour & Flanigan store. I would buy this dining set today.... only the shipping is so expensive. It's almost the same cost as the set itself. Does this company ever waive the shipping costs? BEST ANSWER: We may be able to assist you with a discount on the furniture to help offset the price of delivery. For assistance, please contact us at 866-383-4484 option 3. I love this dining set, but am nervous to order as I live a good distance away from where your stores are. Is there any way I can a pictures of this (Kenton II 5-pc) in addition to what I can view on the computer? Sometimes, pictures are deceiving (especially on the computer). BEST ANSWER: I'm sorry. The online photos are the only ones we have available. is this table in stock for pick up ? BEST ANSWER: Our stores have this set on display, but we do not stock items for immediate pick up. Once you place your order, we can ship the furniture to the store in just a couple of days, or you can take advantage of our in home delivery service. Is the buttermilk finish more of a cream, yellow, or beige? BEST ANSWER: The buttermilk finish is closest to a cream color. DOES THIS SET COME IN ANY OTHER FINISH BESIDES THE WALNUT, A LIGHTER ONE? BEST ANSWER: The Kenton II dining set is available in stock as shown. Other finish choices can be viewed exclusively at your local Raymour & Flanigan store. Does this set come with rectangular table? BEST ANSWER: I'm sorry. The table is available only as pictured in the round shape. I am looking for a China closet or buffet for this set? BEST ANSWER: There is not a server or china cabinet that is an exact match for the Kenton II collection. We do have several options that will coordinate. I suggest the Fair Harbour Server.